Has Dave Chappelle handled fame exactly right? On Thursday morning last week, the Chicago House Of Blues announced that Dave Chappelle would be performing that Sunday night. Tickets—priced just over $60, including fees—sold out almost immediately, and a second show was added, and also sold out quickly. This probably wouldn’t be news—big-name comedian sells out smallish venue—if Chappelle hadn’t been such an elusive character since he walked away from his massively successful Comedy Central show in 2005, keeping a low profile ever since. Chappelle’s reasons for leaving and the way he’s taking cautious steps toward returning make him a fascinating character—in addition to the fact that he was one of the smartest, funniest comics in the world at the time of his self-imposed exile. Clearly burnt out by the business, Chappelle walked away from a reported $50 million because he didn’t like the direction Chappelle’s Show was headed; he wasn’t comfortable with all the material, he felt it had slipped from his control, and he was tired of working himself to death to get it done. And he didn’t merely refuse to sign a new contract—he literally just didn’t show up to work, and headed to Africa to clear his head. He was publicly tired of fame by that point, and more specifically, the attention it brought him from insensitive idiots who loved it. Tired of having people yell “Rick James!” at his stand-up gigs, Chappelle had a couple of public meltdowns. It’s been seven years—two lifetimes in Hollywood—since he did any regular stand-up gigging, and now he’s doing it on the sly, announcing shows right before they happen, reportedly traveling around the country on his motorcycle. Signs inside and outside the House Of Blues said “NO HECKLING / NO RECORDING.” The gathered audience, mostly guys, had obviously heard that Chappelle hated rowdy, disruptive crowds. But practically the minute he stepped onstage, one guy in front of me started recording, and the other started yelling. Strangely enough, some of those interactions sparked Chappelle’s best moments that night. It pains me to say that, because I plunked down my money to see Dave Chappelle be funny, not to fend off attention-seeking whelps, but it speaks to where Chappelle’s head is at that a guy who yelled, apropos of nothing, “Chicago blue cheese!” started a joke that Chappelle returned to for the rest of the night. Or that another loudmouth who yelled “We love you people!”—meaning African-Americans, trying to be provocative—would get Chappelle started down a thoughtful road on race. He wasn’t fazed, which is a great sign. 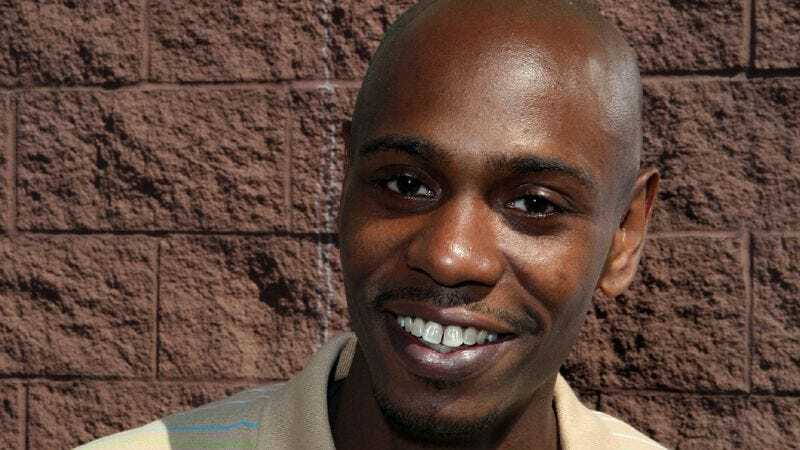 So where does Dave Chappelle go from here? He’s clearly in a better mental place than he was a few years ago, having settled into family life in Ohio and kept Hollywood mostly at arm’s length. The stuff he’s chosen to do—stand-up gigs like this one, a couple of great appearances on Inside The Actors Studio, the feature-length Dave Chappelle’s Block Party—seem like they’d be creatively satisfying, though they don’t have the massive reach (or payday) that comes with doing big-budget movies or TV. But the landscape Chappelle would return to if he chooses feels considerably different than the one he left. He needs only to look to Louis CK for career advice at this point: CK is living proof that a talented, cantankerous, in-demand comic can pretty much follow any path he wants to, provided he’s willing to make certain sacrifices. Those sacrifices mostly seem to involve being willing to work hard and give up huge paydays, both of which Chappelle seems to be abundantly ready for at the moment. Maybe he’s content to just enjoy himself, though, and to pop up in big cities once in a while, tell some jokes, make a few bucks, and head back to Ohio. If that’s the life that keeps him sane and happy, he ought to stay there—it’s a rare performer who chooses to stay out of the limelight. But here’s hoping that putting himself in front of willing, loving audiences—even those that insist, annoyingly, on being part of the show—will inspire Chappelle toward something more. He walked away for admirable reasons; it’d be inspiring to see him make new work with the uncompromising spirit that drove him to flee.